Dove Mountain is one of the few places in the country where you can enjoy an outdoor lifestyle all year round. The breathtaking desert mountain landscape combined with the unique climate and nearly untouched natural surroundings make Dove Mountain an outdoor enthusiast’s paradise. Walking, jogging, hiking, biking and even horseback riding are enjoyed by people of all ages on Dove Mountain’s more than 60 miles of trails. 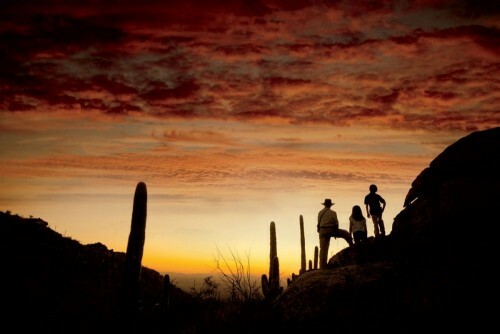 There is plenty to be discovered on these high Sonoran Desert trails that range in elevation from 2,800 – 4,300 feet. View and print the Dove Mountain Trails Map. Almost all trails are multipurpose. However, if you’re looking for pedestrian-only trails, check out Alamo Springs and Lower Javalina. These two are great for younger kids and adults who want or need to go at a slower pace. Also, be sure you bring plenty of water and some snacks or meals if you will be going out on longer hikes. Proper hiking boots will protect your feet from sharp rocks and other elements. Be aware of cacti. They are all around you in Dove Mountain and can easily get stuck in clothing. As a tip, bring a comb with you to remove any cholla cactus that you may come in contact with. It’s always best to hike with someone else or a group of people rather than hike alone. If you do go alone, make sure to tell someone when you are leaving and when you plan to return.